Product prices and availability are accurate as of 2019-04-18 20:01:57 EDT and are subject to change. Any price and availability information displayed on http://www.amazon.com/ at the time of purchase will apply to the purchase of this product. 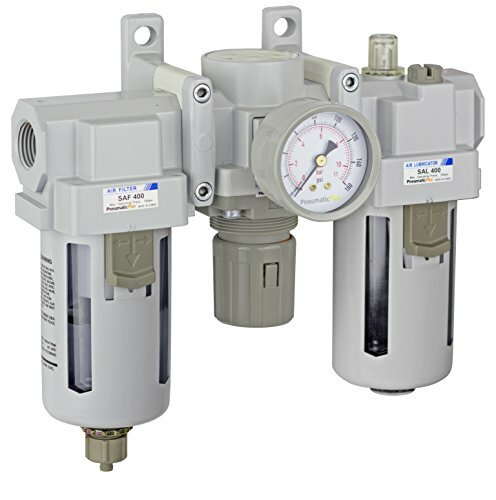 PneumaticPlus SAU Series Modular Air Filter Regulator Lubricator units offer a complete airline solution for the most effective air filtration, pressure control and air lubrication to keep your air tools working properly. . The SAF Filter comes standard with a 10 Micron Particulate element that removes harmful debris and moisture. The SAR Regulator provides precision pressure control that can be adjusted and set using the locking knob. Oil Injection on the Lubricator can be adjusted and completely turned off as necessary to your application. SAU Series Modular Air Filter Regulator Lubricator units are offered with Drain (Manual or Auto) and Bowl (Metal or Polycarbonate) options to better suit your needs. Search for different bowl and drain options by typing SAU PneumaticPlus in Amazon's search box. SAU Series units provide an easy solution to drying and lubricating your air system with precision control. DO NOT INSTALL A POLYCARBONATE BOWL IN PRESSURES THAT EXCEED 150 PSI OR WHERE THERE IS A PRESENCE OF SOLVENTS HARMFUL TO POLYCARBONATE. PneumaticPlus SAU Series Combo Units provide quality air filtration for compressed air applications with the flexibility to adapt to the changing needs of your system. Its modular design allows for quick, simple connect or disconnect of units to customize your unit to your specific needs, requiring only a screwdriver or hex key. Units can be installed in any location on a single plane without requiring changes to existing piping. SAR Regulators can be mounted either up or down, and the pressure is controlled using the adjustable locking knob. SAF Air Filters remove harmful debris and moisture from your air supply. SAL Lubricators can be adjusted easily to specifications of your tools and applications for proper protection. Diverter blocks may be used to supply air to secondary locations. Units are designed to fit National Pipe Thread (NPT) sizing. Please visit our Amazon Store for our complete line of air products.